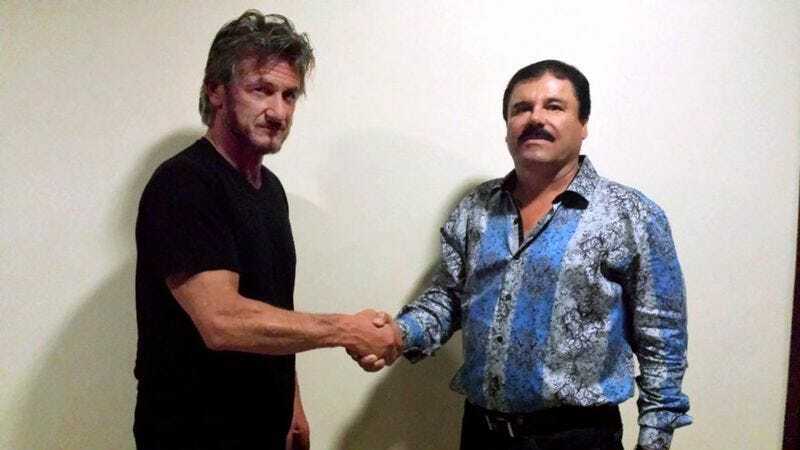 Actor Sean Penn, posing with Joaquín Guzmán, a.k.a. "El Chapo"
The New York Times is reporting today that fugitive drug kingpin Joaquín Guzmán—a.k.a. El Chapo, the head of Mexico’s notorious and extremely lethal Sinaloa drug cartel—was recaptured by authorities at least in part because he was trying to get a biopic made about himself. Guzmán escaped from police custody—for the second time—roughly six months ago, at which point he apparently ordered his associates to begin reaching out to movie producers and actors about getting a film of his life story put into motion. Those efforts apparently opened up “new lines of investigation” for federal investigators according to Mexico’s attorney general, which led to Guzmán’s recapture on Friday. In Guzmán’s defense, his story—rising from poverty to control of a billion-dollar drug empire—would make for a pretty compelling project (although we’d note that this sounds a lot more like a cable prestige series than a movie.) Maybe he’ll be able to arrange some Hollywood meetings with AMC or HBO if the U.S. government gets its way and manages to extradite him Stateside, to stand trial for all the camera-ready, grittily anti-heroic murders and kidnappings he’s alleged to have committed over the years. UPDATE: And now, Rolling Stone has an interview with El Chapo, conducted before his recapture by—it probably goes without saying—international narcotics journalist and Fast Times At Ridgemont High star Sean Penn. The interview—which features such gems as Penn referring to his cohort Espinoza as, “the owl who flies among falcons”—was set up with help from Kate Del Castillo, a very popular Mexican soap opera star, because there is no facet of this story that fails to insist on being utterly ridiculous.